2 BEDROOMS | 1 BATHROOM | 1480 SQ. FT. I had the pleasure of meeting Wendy, around 10 years ago. I was referred to her by her daughter and son-in-law who had purchased a home with me in West Seattle. She wanted to move closer to her daughter’s growing family. In 2011, we found her this amazing home on Graham Street. Fast forward to 2017. Wendy and I met to talk about the next chapter in her life. She wanted to “get out of the rat race” and find a quiet place to live on the Peninsula. We put a plan in place to find her the property, fund the purchase with a HELOC and prepare her home for sale. Wendy and I worked together for a year to strike the perfect balance of cost versus value (of both time & money) to get the house ready to list. With the right preparation, pricing and marketing strategy, we were able to exceed her goals. She is now building her dream house in her dream location with a few unexpected upgrades! If you are considering a move in the next few years and want to find out your options, I would be happy to meet for coffee! Light-filled classic Seaview home, located within blocks of everything Morgan Junction has to offer. This home features the perfect mix of amenities and harm. A block away from The Bridge, Little Prague Bakery & Cafe, Metro Route C, 128, 22, 116, 118 and 119 and just minutes from Alaska Junction! Sunny enclosed porch. Two light-filled bedrooms with fir floors. A full bathroom connects the rooms. The Living room, dining room, and large kitchen with pantry complete the main floor. Large, unfinished basement with good ceiling height and additional crawlspace storage. An abundance of storage now with the potential to add more living space! Freshly painted interior ini 2018. New roof in 2017. Updated electrical and front proch in 2016. 3 off-street parking spaces. 2 tandem spaces to the left of the house and 1 in the alley. 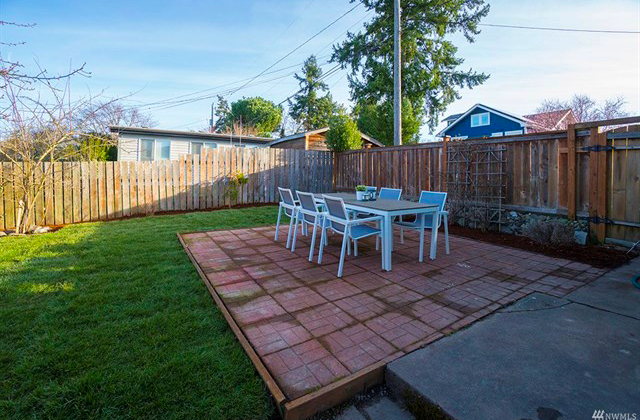 Lovely back patio with additional space to garden within the fully-fenced backyard!